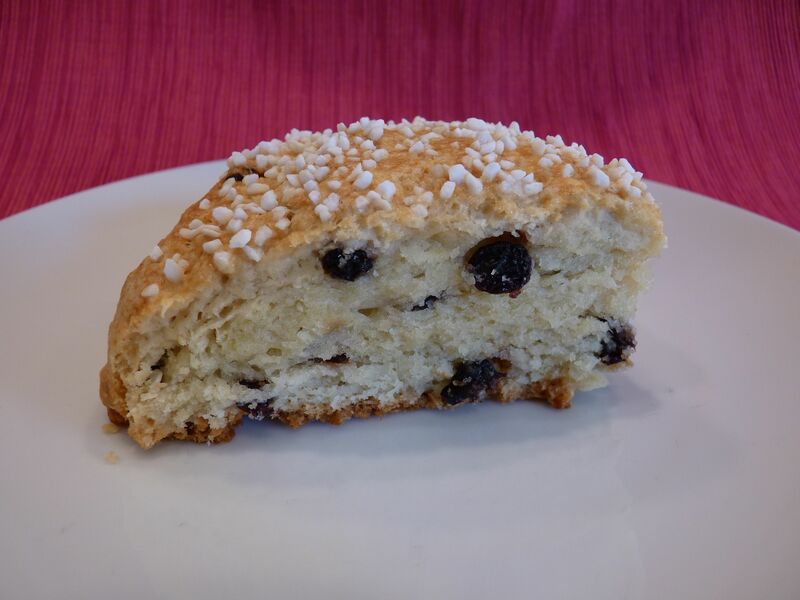 Classic Currant Scones from the the Flour cookbook. The best scones I’ve ever made! They were tender without falling apart. Just a little sweet, but still ready for some jam or honey. Moist, but not so moist that you’d mistake them for anything other than a scone. The recipe calls for creme fraiche, which I couldn’t find at the grocery store, so I followed the instructions to make my own. I made a small batch, mixing 8oz heavy cream with 1 Tablespoon of buttermilk and letting it sit in a warm spot overnight (I put mine on top of the refrigerator). When I opened the container in the morning, I found a bowl of pure silk. Oh my goodness, it was so creamy and delicious! It doesn’t have the tang of sour cream or yogurt, so I can see why the recipe says not to substitute. Michele sent me this recipe and we baked “together” from different parts of the country. Be sure to check out her blog post to see how hers turned out! If you don’t have the book, you can find the recipe here on Google books. I’m so glad that you like the recipe. Your scones look perfect. I’ve never made creme fraiche but since you had such good success I’d like to try. Thanks for baking with me! favorite type of scones ever. these look great. I don’t make very good scones-which surprises me, because I make pretty decent biscuits. These scones look absolutely delicious! Nice Job! The best scones ever? That’s high praise! I love Dorie’s scones, but now I’ll have to try these too. Looks like another winner from Flour! I’m glad you had good luck making your own creme fraiche, I really want to try it soon. It’s available around here, but fairly expensive. These scones look delish! Is that pearl sugar on top? The best scones you have ever made, high praise indeed! They certainly look lovely and delicious.